Two genes, FOXM1 and CENPF, have been found to work together and drive the progression of the most lethal forms of prostate cancer. New research from the Herbert Irving Comprehensive Cancer Center at the Columbia University Medical Center suggests that neither gene alone significantly contributes to prostate cancer but when both genes are turned on, they work synergistically to activate pathways associated with the most aggressive form of the cancer. This novel discovery can lead to a diagnostic test for identifying aggressive tumors and provides an opportunity to develop groundbreaking therapy for aggressive prostate cancer. It is very difficult for researchers to distinguish the handful of genes whose altered expression contributes directly to cancer. It becomes even more difficult when genes must be analyzed in pairs rather than being analyzed individually. For instance, approximately 1,000 genes that have been linked to cancer can be combined into about 500,000 gene pairs, each of which may represent a synergistic tumor driver. In addition, prostate cancer is particularly challenging because it has a wide variety of clinical presentations. In prostate cancer studies, researchers rely on mouse models to identify genes that are expressed in disease. However, inherent differences between mice and humans make it difficult to draw a conclusion from these investigations. Columbia cancer researchers developed a novel experimental approach in which they used computational approaches to compare the gene regulatory networks which drive prostate cancer in humans with those in a genetically engineered mouse model. By tracing the genetic regulatory networks of tumors in both species, Columbia cancer researchers were able to identify the pair of driver genes of malignant prostate cancer. To validate the roles of FOXM1 and CENPF, Colombia researchers silenced the expression of the genes in four human prostate cancer cell lines. They discovered that silencing either gene alone had only a modest effect on the ability of the cells to form tumors, but co-silencing both genes at once completely stopped tumor growth. Researchers then analyzed more than 900 prostate cancer patients who undertook prostate removal surgery. The analysis showed a striking correlation between the co-expression of FOXM1 and CENPF and the disease outcome. The correlation is consistent with synergistic interaction, where the joint effect of two genes is much greater than the sum of individual effects. The Columbia cancer researchers’ discovery is a promising step toward a deeper understanding of the genetics of cancer. The tools and approaches developed in this study may have broad utility in medical research. For instance, cross species computational analyses also could be used to identify causes of other cancers as well as of other complex diseases. Columbia researchers have achieved significant results in genetic studies. Professor Martin Chalfie from Columbia University was the first biologist to introduce the use of green fluorescent protein in labeling cells into intact organisms. Columbia scientists are credited with about 175 new inventions in life sciences each year. And more than 30 pharmaceutical products in the market today were based on discoveries and inventions made at Columbia University. $807 million for research from public and private sponsors in 2013. $100 million in license revenues. $230 million from patent-related deals in annual revenue. Over $117 million research funding from the National Institutes of Health in 2014. 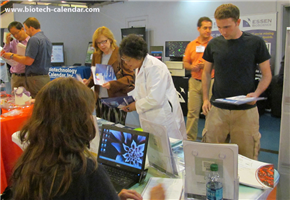 Biotechnology Calendar, Inc. organizes four BioResearch Product Faire™ Events in New York City each year. 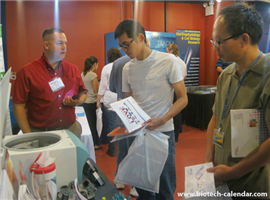 This year’s BioResearch Product Faire™ Event at the Armory Track and Field on September 30th 2014 is located very close to the Columbia University Medical Center. It is the 4thannual BioResearch Product Faire™ Event at Armory Track and Field and the majority of attendees are Columbia University researchers. Last year, the BioResearch Product Faire™ event at the Armory Track & Field Center attracted 436 attendees. Of these attendees, 127 were purchasing agents, professors and post docs, and 63 were lab managers. These attendees came from 19 different research buildings and 54 on-campus departments. If you are a laboratory supply company and would like to participate in the BioResearch Product Faire™ Event at Armory Track and Field on September 30th 2014, please click the button below. There are more BioResearch Product Faire™ Events available at different institutions throughout the nation. Please read the Show Schedule for 2014.